Using the Dominic System is a great way to remember up to 100 random items. However, what if you were in school and you had a list of over 100 items that you needed to memorize, what then? For example, many law and medical students frequently have to memorize upwards of a 1000 things for their exams. Ron Hale-Evans, creator of the Mentat Wiki and author of Mind Performance Hacks came up with an unique way of ‘hacking’ the Dominic System to increase it up to 100-fold. That’s right, up to 10,000 individual items can be memorized and accessed at any time! This is accomplished through what Ron calls the ‘Hotel Dominic’ hack. In this, the final post of a 4-part series on memorization techniques, I will explain how to use the Hotel Dominic hack to remember up to 10,000 items of information. Each floor in this hotel represents a specific character from your Dominic list and each room on that floor is the action which that character performs. 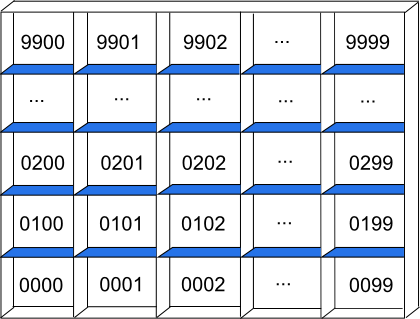 As discussed in the previous post, when dealing with 4-digit numbers, the first pair of numbers represents the character and the second pair of numbers represents the action that the character uses. For example if you are using the 0001 slot using my name list, this would represent Ozzy Osborne using Neo’s (from the Matrix) action. In other words, picture Ozzy dodging bullets and seeing the bullet’s hypersonic wake move by his body slowly. This is your peg. The next step is to associate what it is you want to memorize with that peg, and use some type of ridiculous action to weld the two together. Let’s say you want to memorize all the U.S. Presidents in order. Since there are currently 43, I would choose 43 slots in order, say 0000 – 0042. I would peg each president in order of service, to their corresponding slots. For example, since 0000 represents Ozzy Osborne doing his own trademark action of biting off a bat’s head, I would picture George Washington having just finished chopping down a cherry tree. As it falls it hits a bat in mid flight out of the sky. Ozzy then catches the bat in his mouth and rips its head off with his teeth. You continue associating these ridiculous stories with their character pegs until you have all of the Presidents memorized. What’s great about this system is not only do you have up to 10,000 slots to use for memory pegs, but you also don’t need journeying to link one slot to the next. In other words, they are all completely independent. Whether you’re currently in school or just want a better way of remembering things, I know that the techniques covered in this 4-part series will be a help to you as they are to me. If you know of any other great techniques for memorizing things, definitely let me know, I’d love to add it as an addendum to this list.